Friends and family are over and your about to watch the game, but you need some food that’s easy, filling, and oh so tasty! 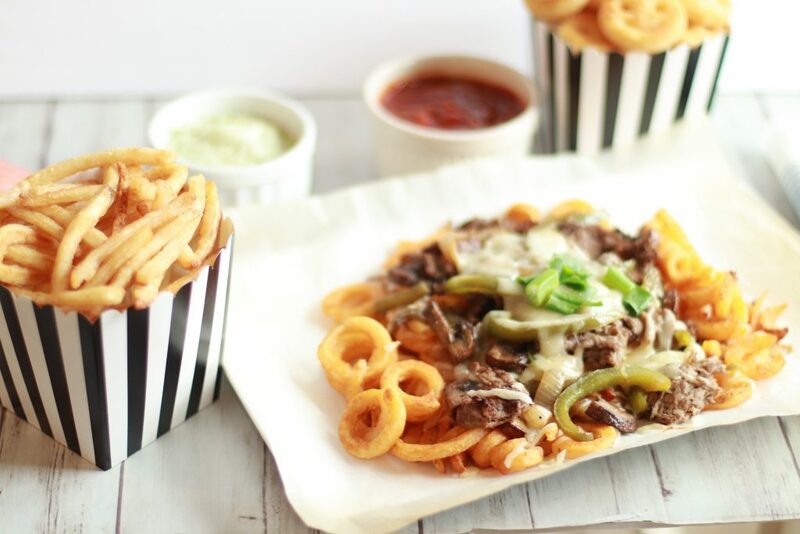 Enter the Loaded Philly Cheesteak Nacho Fries! 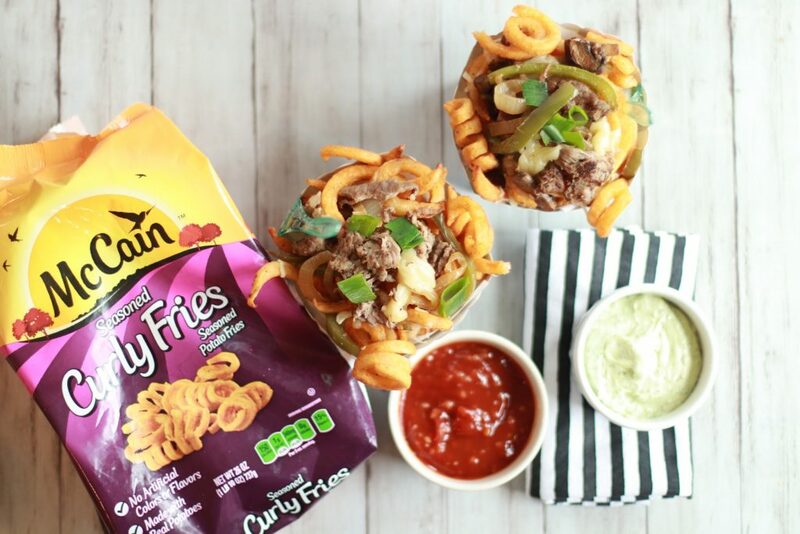 McCain® Seasoned Curly Fries Seasoned Potato Fries are baked in the oven until crispy. Then topped with Mozzarella , Provolone, sautéed Mushrooms, Onions, Peppers, and Thinly Sliced Ribeye Steak. One of my favorite things about Game Day is the menu! I just loving having a spread out for everyone to enjoy! Today we’re preparing for Game Day with McCain. 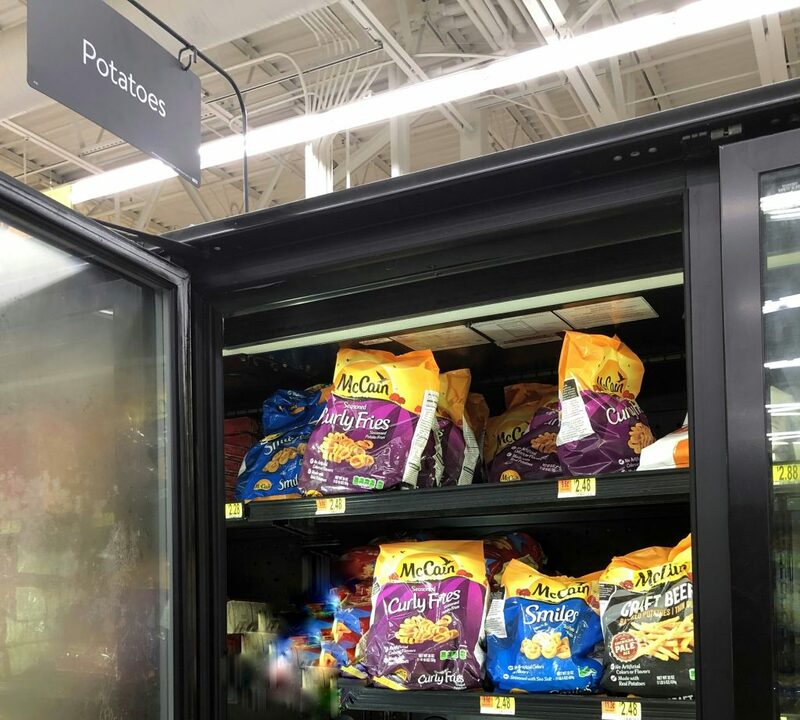 I’ve purchased McCain® Smiles® Mashed Potato Shapes, McCain® Craft Beer Battered Thin Cut Fries, and McCain® Seasoned Curly Fries Seasoned Potato Fries all from my local Walmart! 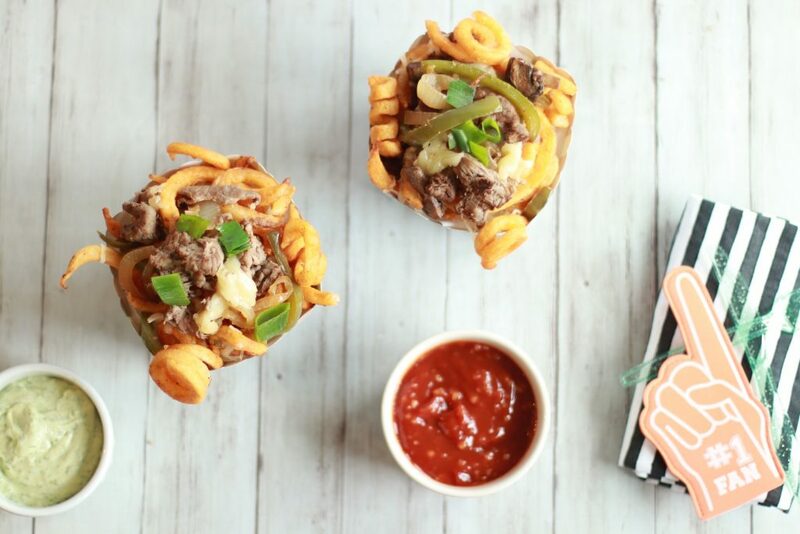 I’m making Loaded Philly Cheesesteak Nacho Fries as well as two easy dipping sauces! I love McCain because I know their products are made with real potatoes that are the perfect match for any game day spread. 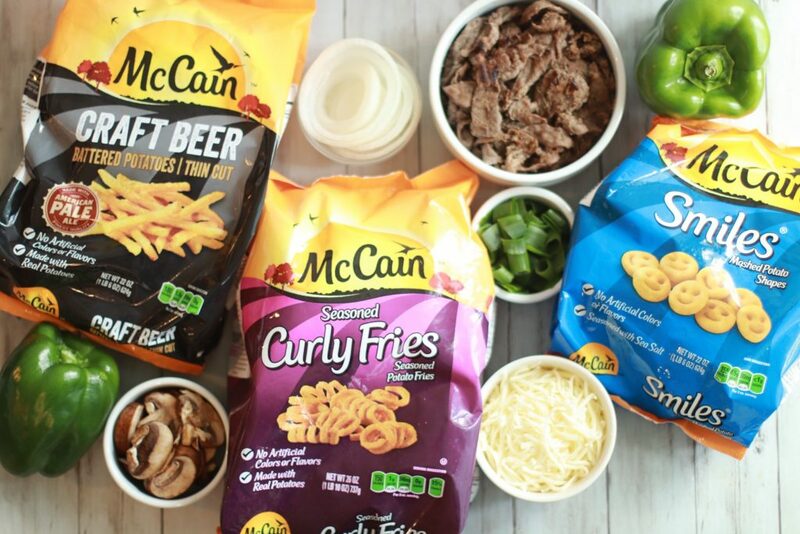 Plus, from now until 5/31/19, you can get $1.50 off when you purchase 2 participating McCain products at Walmart. You can submit your rebate & learn more details here. Simultaneously you can start heating a pan on the stove at med-high heat. Line a baking pan with parchment paper. 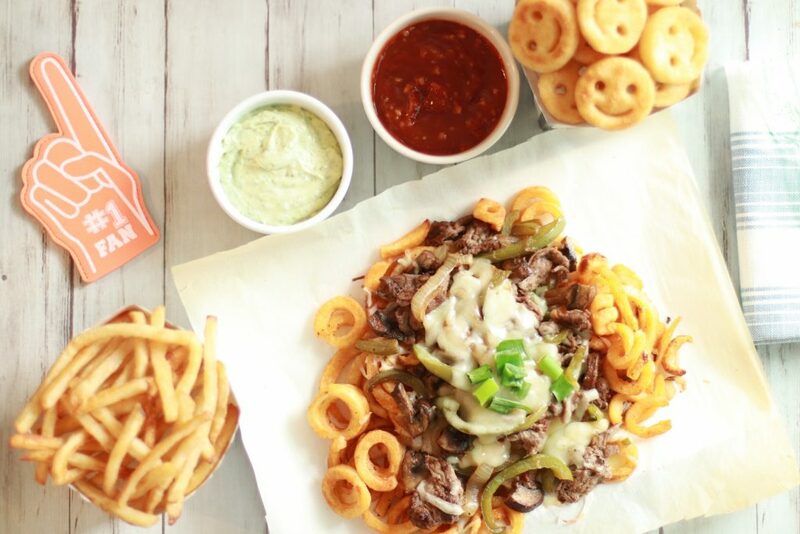 Place your McCain® Seasoned Curly Fries Seasoned Potato Fries in a single layer on the parchment paper.Bake them in the oven for about 10 minutes. While they’re cooking add a tbsp of butter to your pan. Next, add your mushrooms, onions, and peppers. Next, add your steak to the pan. Sauté until the meat is fully cooked, it should be browned on both sides & your veggies should be soft. When the timer goes off for the fries take them out of the oven. 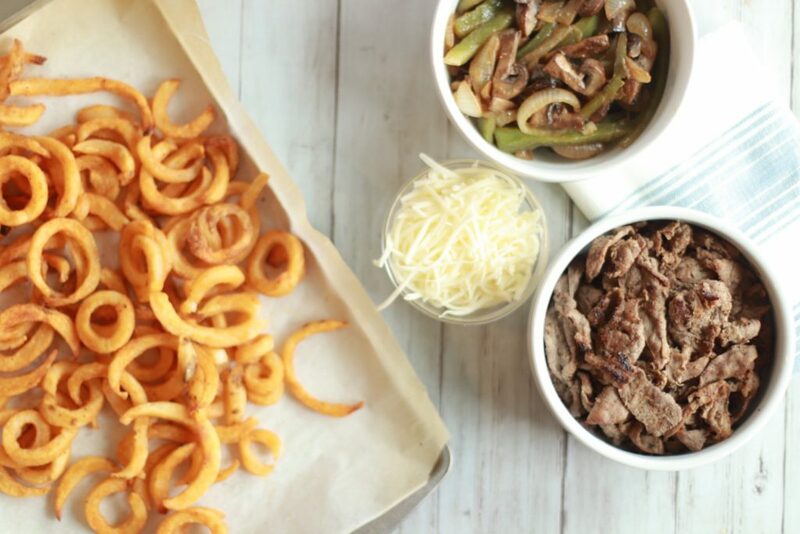 Add your steak, mushrooms, and onions right on top of the fries. Finally, sprinkle your cheeses all over the top. Bake for an additional 5-8 minutes. Once, the fries are golden brown and your cheese is melted remove them from oven! Serve with your sauces and enjoy! To make your ketchup combine one cup of ketchup with a Tbsp of Hot Sauce and a Tbsp of Crushed Garlic. Mix well! To make this sauce combine 1 Tbsp of creamy horseradish and a 1/2 cup of mayonnaise. Then add it to the food processor along with a 1/2 cup of fresh chopped green onions. Blend well and serve! Also, Heat a pan on the stove at med-high heat. Place fries in a single layer on parchment paper. Bake in oven about 10 minutes. While they’re cooking add a tbsp of butter to your pan. Add your mushrooms, onions, and peppers. Next, add your steak to the pan. 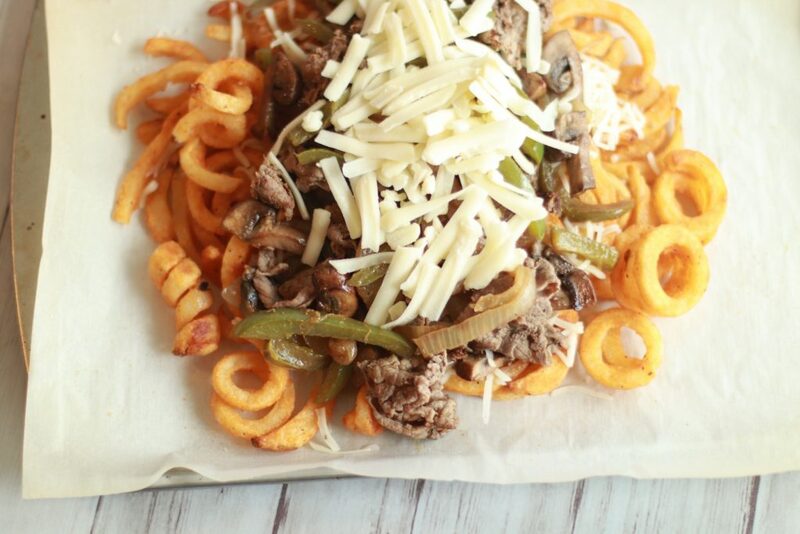 Add your steak, mushrooms, and onions on top of the fries. Sprinkle your cheeses all over the top. Bake for an additional 5-8 minutes. Once, the fries are golden brown and your cheese is melted remove from oven! Serve with your sauces and enjoy! I served these loaded fries along with the two sauces. I also made the McCain® Smiles® Mashed Potato Shapes, and McCain® Craft Beer Battered Thin Cut Fries. They are all different , yet crispy and delicious! They pair perfectly with all your game day snacks! Now that it’s finally getting warmer, I love being able to enjoy tender, juicy meat straight off of the grill. Today I’m sharing a Steak house inspired recipe with you. These Grilled Pork Chops with Apple Bacon Jam are tender, flavorful, and perfect! I’m pairing them with Lyonnaise Potatoes and some Asparagus for the perfect dinner anyone can recreate at home! Easter is right around the corner and I can’t wait! I’m already making plans to ease the Holiday busyness. Starting with these Easy Overnight Breakfast Enchiladas with Hatfield. One of my top priorities is smoothing out the menu. Having a filling and delicious breakfast is important to me, but I also don’t want to be running around the kitchen like a crazy person! That’s why it is so important that breakfast be easy, with minimal prep time. I don’t want to miss out on a single minute with friends and family! These Easy Overnight Breakfast Enchiladas with Hatfield are perfect because they are prepped entirely the night before! We love making our own pizza around here. It’s yummy and you can customize it in any way you want! From Tzatziki Sauce to Feta, this Mediterranean Chicken Pizza has all of the classic Greek flavors you love. This Reuben Soup is basically like a deconstructed version of a Reuben. Man oh man.. is it delicious! It has a cream base. It’s filled with vegetables & corned beef. Then it’s topped off with the most perfect little croutons (I literally could not stop eating the croutons…by themselves .. like they were chips). They are just so good and they compliment the soup wonderfully giving it the crunch it craves! Our love of football runs deep in this house and I’ve already started planning for the “Big Game”. (Let’s be real, I’m probably even more excited about the food.) This “Football Finale” is fast approaching and no matter what team you’re rooting for, it is the perfect back drop for friends & family to gather around with fun, entertainment & delicious, food. 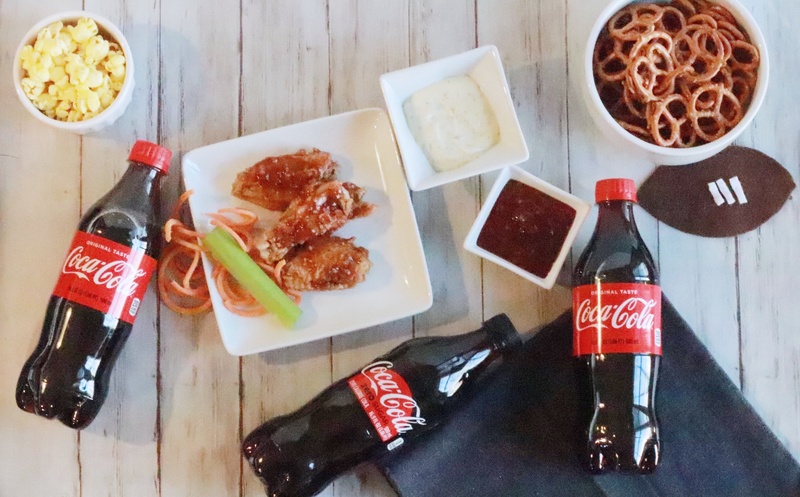 So, I’m sharing these Game Day Appetizers Made Easy with Hatfield. Christmas is by far my favorite time of year! It’s filled with so many great traditions. Making cookies, decorating the tree, building a Gingerbread House, and one of my favorites: having a Holiday Ham Dinner. When it comes to Ham, it’s important to purchase a high quality Ham from a company you can trust. Hatfield® has a fool proof recipe for creating the best pork products. I love their promise to the environment: they use environmentally-friendly fuel sources and take recycling very seriously. Plus, they make sure their farmers meet the highest standards for good farming practices and use only pigs from a long line of heritage. Then they treat those pigs with care, practicing high safety standards, and holding humane handling training. They are ethically raised with no hormones or steroids added! Long story, short – They take pride in what they do and provide the best pork products for you and your family to enjoy. 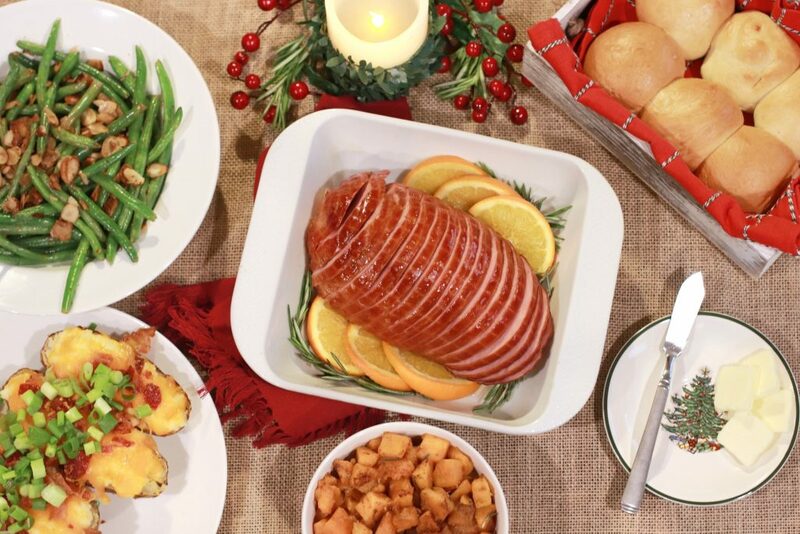 I’m happy to be using Hatfield® Ham in my Holiday Dinner! 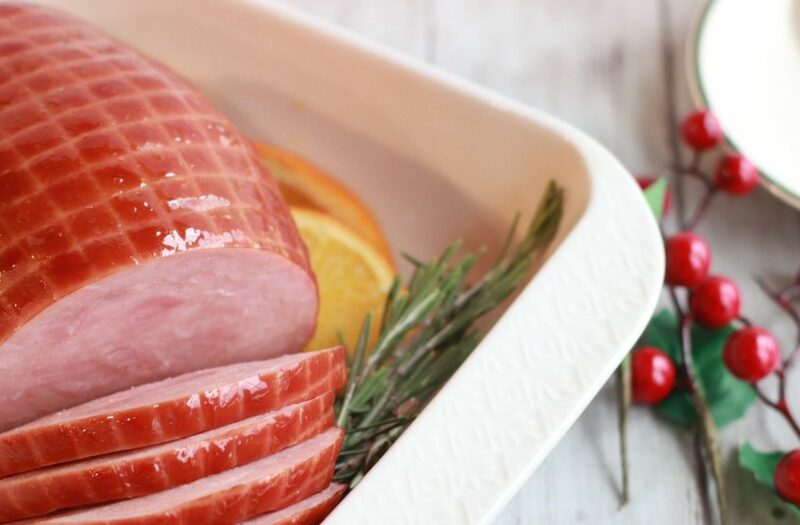 And now, Hatfield makes it easier to serve up a delicious holiday meal to your family, big or small, with the NEW smaller sized ham products available in ½ Pre-Sliced Pit Ham, ¼ Pre-Sliced Ham (With Natural Juices or With Water Added). There’s a Ham for everyone! 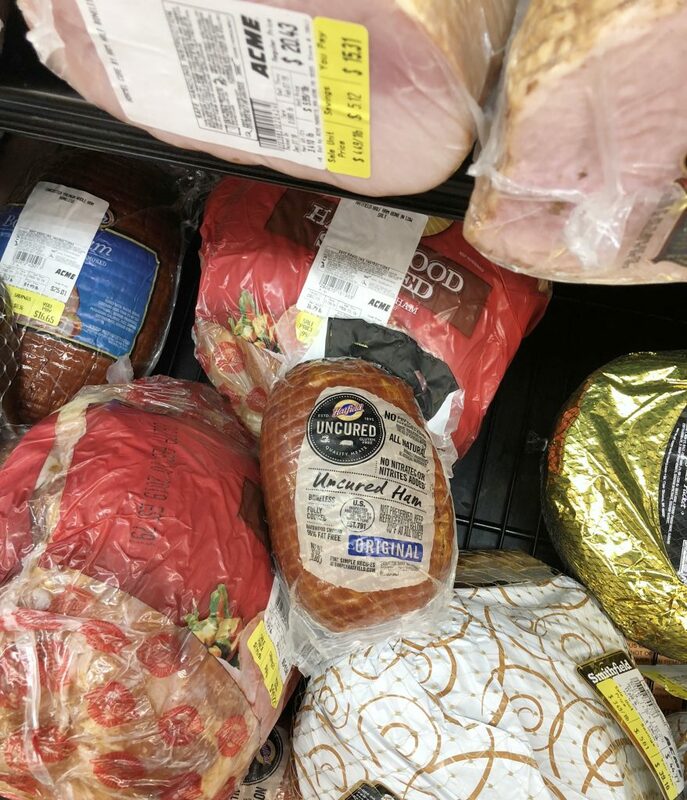 The Hatfield Hams are conveniently located in the Ham section, next to the deli meats in the grocery store. I picked mine up at my local Acme. 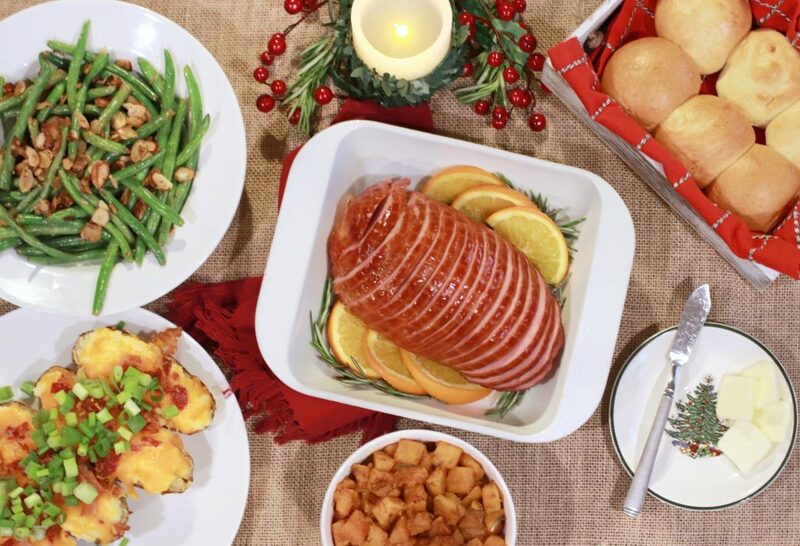 I’m going to show you how to create The Perfect Holiday Feast with a Hatfield® Uncured Ham. 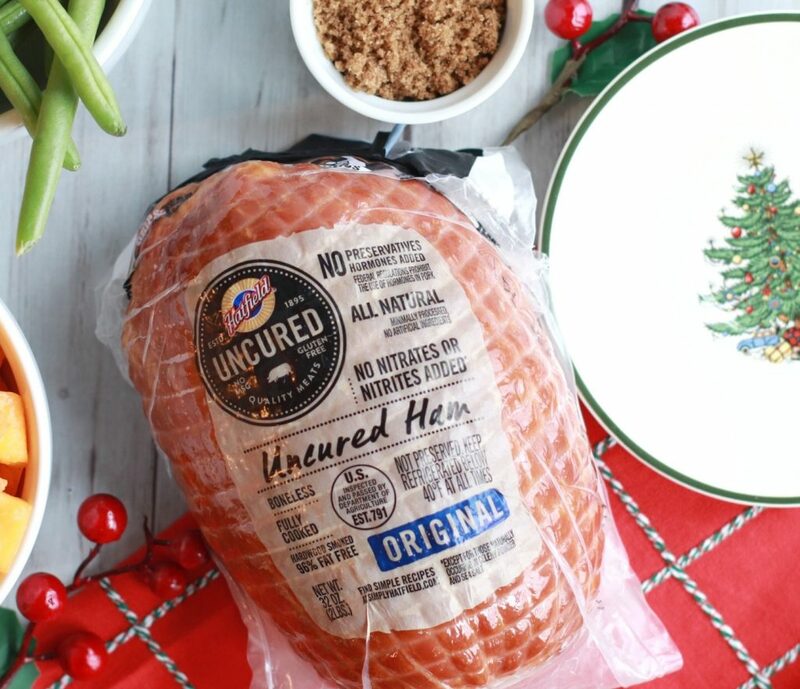 For a limited time only, receive a $2 rebate upon purchase of any Hatfield® Uncured Ham with Ibotta. First, let’s talk about the ham. 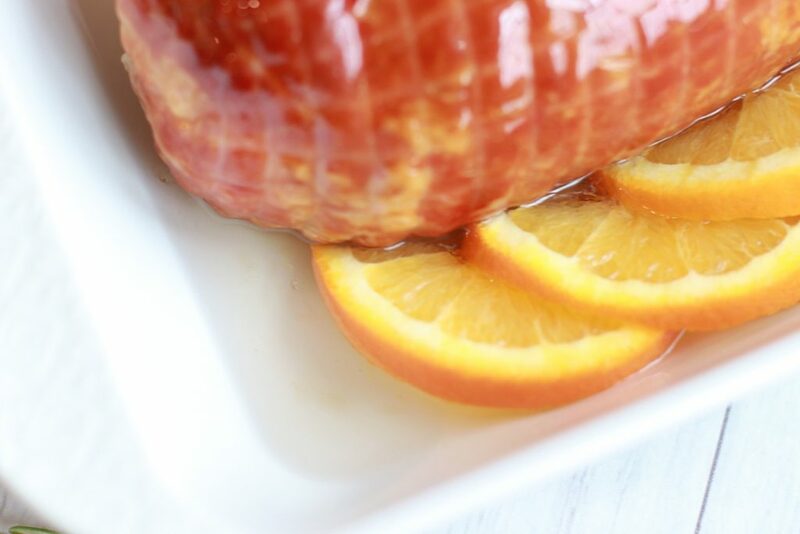 These Hams are so convenient and can be put right in the microwave or oven to heat. I’m going to bake mine, and I’m adding a little glaze. 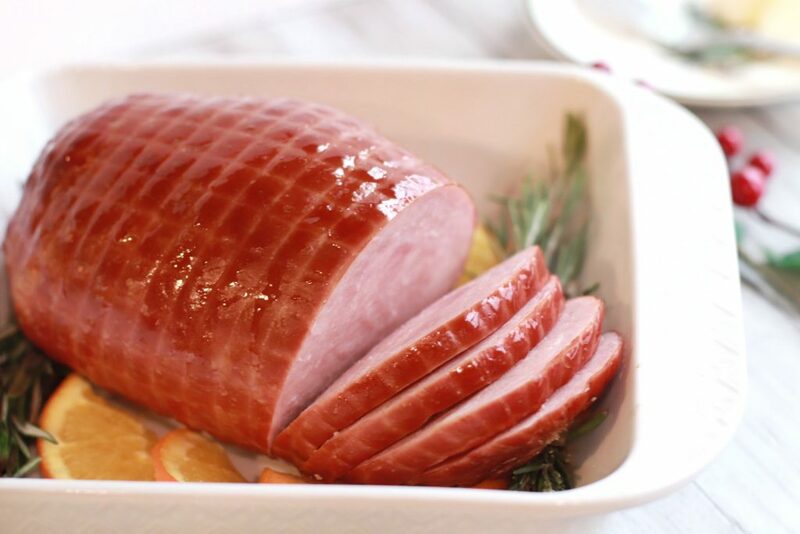 To make my Maple Honey Glazed Hatfield Uncured Ham, Pre heat your oven to 325 degrees. Following the directions on the package, Add your Ham to a shallow baking pan. Pour in about 1/2 an inch to an inch of water in the bottom of the pan. Place three orange slices on either side & some rosemary sprigs. 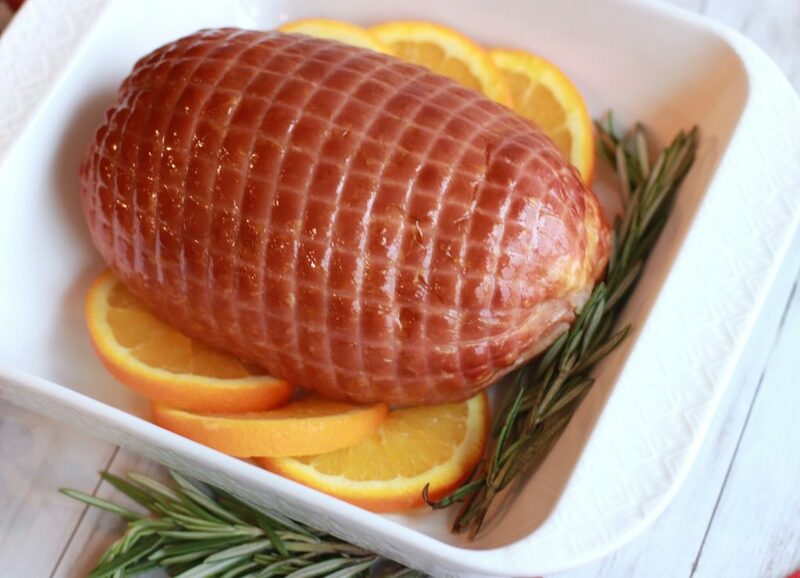 Finally, brush the Ham with a little Honey Maple Glaze. To prepare the glaze, mix 3 tbsp of honey with 3 tbsp of maple syrup. Cover the ham completely with foil. Cook it for about 20 minutes per pound, making sure that the internal temperature reaches 140 degrees before you serve it. Mine took about 40 minutes. When you’re ready to slice it, you can use the lines on it as a guide! 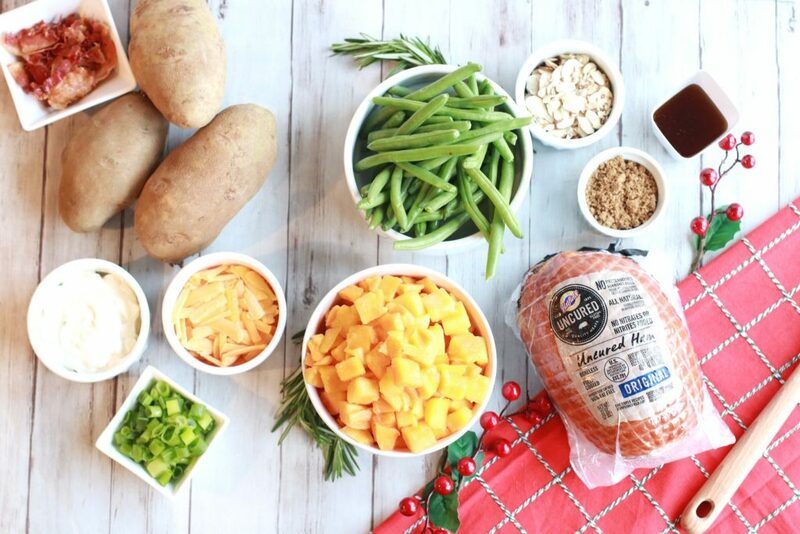 To compliment the Ham I’m sharing my favorite holiday dinner recipes for: Loaded Twice Baked Potatoes, Green Beans Almondine, Roasted Rosemary Squash, & finally Mama’s Old Fashioned Rolls. These potatoes are easy to make and beyond delicious. They highlight the classic savory flavors of a loaded baked potato: bacon, green onions, sour cream, and cheddar cheese! 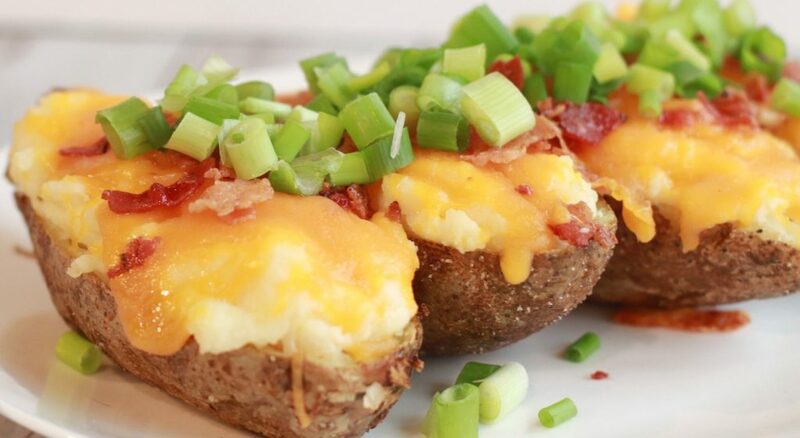 With Loaded Twice Baked Potatoes no one has to worry about topping their potatoes at meal time. They are already ready to go! 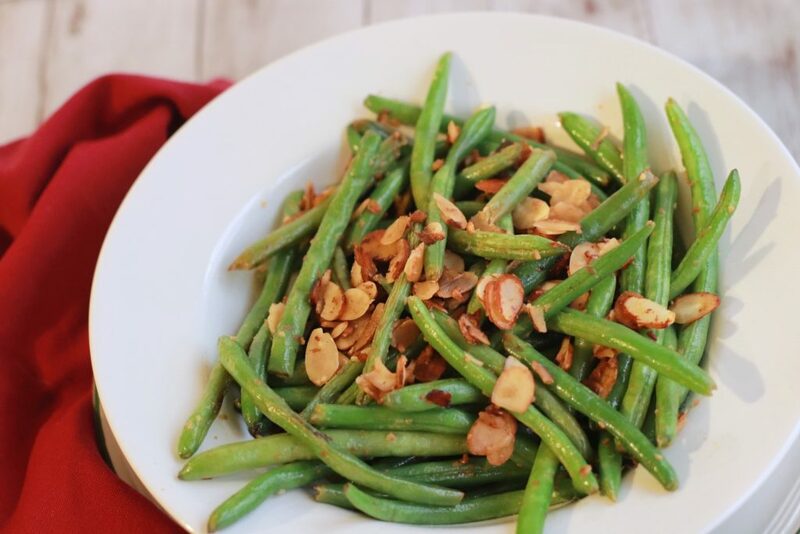 In a “nutshell” 😉 this dish is composed of green beans & almonds. To make this dish, turn a pan up to high heat. Pour in about a 1/2 Tbsp of olive oil. Next, throw in whole, washed green beans. Add a Tbsp of Crushed Garlic, and a squeeze of Lemon Juice. Add a cup of sliced almonds. Stirring often, once they start to brown turn your heat down! Cook for another five minutes. They should still be fairly firm. They are now ready to serve, but you can keep them on low until everything else is ready! For this beyond simple dish, Pre heat your oven to 400 degrees. Cut your Butternut Squash into cubes . In a bowl toss the cubes with a little olive oil, a Tbsp of Cinnamon, and a Tsp of chopped Rosemary. Spread them out on a baking sheet and bake for about 30 minutes. You want them to be tender, but not mushy! 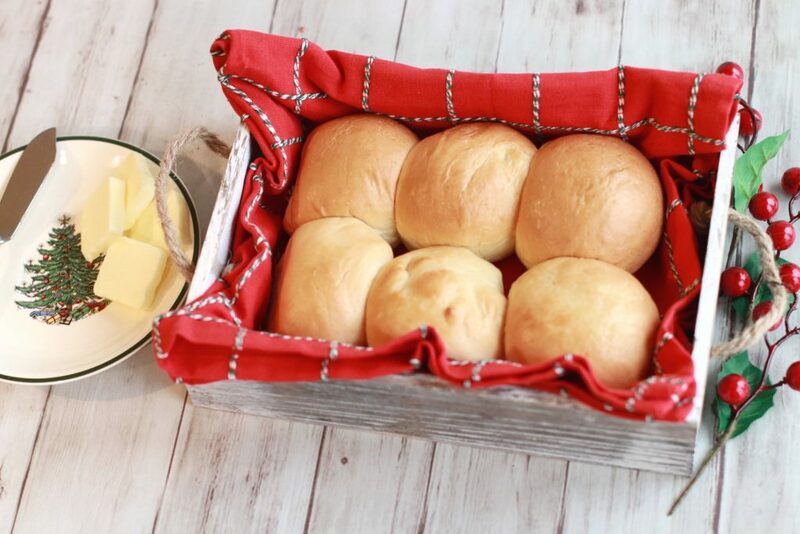 Mama’s Old Fashioned Rolls are a family tradition. After rising for a few hours they only take about twenty minutes to bake! They are pull-apart deliciousness. Bonus, if you have any leftovers after your feast, these rolls plus the Hatfield Ham make one amazing lunch the next day!! You can easily grab some fresh baked rolls at the store as well, to keep it simple! Holiday dinners are one of my favorite times, because I absolutely love being able to catch up with all of the family and make some of their favorite dishes. And Hatfield helps make the holidays better, from their family to yours! Pre heat your oven to 325 degrees. Add your Ham to a shallow baking pan. Pour in about 1/2 an inch to an inch of water in the bottom of the pan. Place three orange slices on either side & some rosemary sprigs. 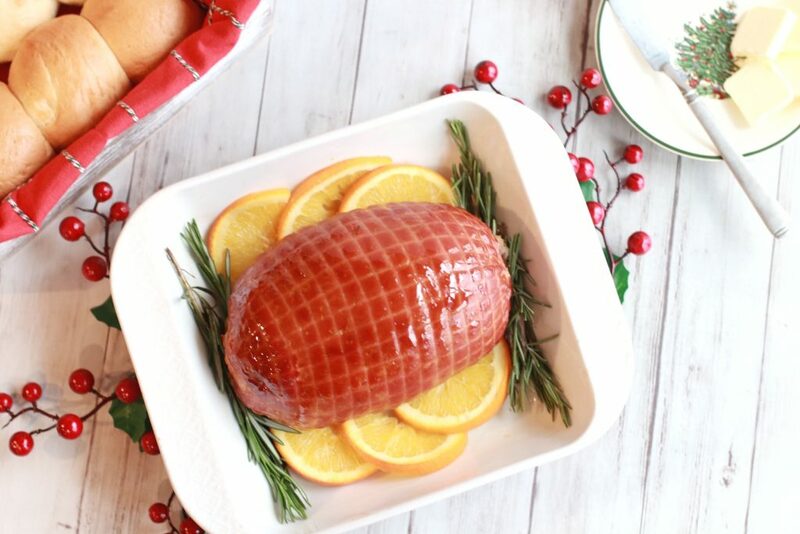 Brush the Ham with a little Honey Maple Glaze. To prepare the glaze, mix 3 tbsp of honey with 3 tbsp of maple syrup. Cover the ham completely with foil. Cook it for about 20 minutes per pound, making sure that the internal temperature reaches 140 degrees before you serve it. With football season upon us, I simply can’t pass up an opportunity to make delicious little finger foods and a spread of apps. And it goes without saying that chicken wings and football go hand in hand. 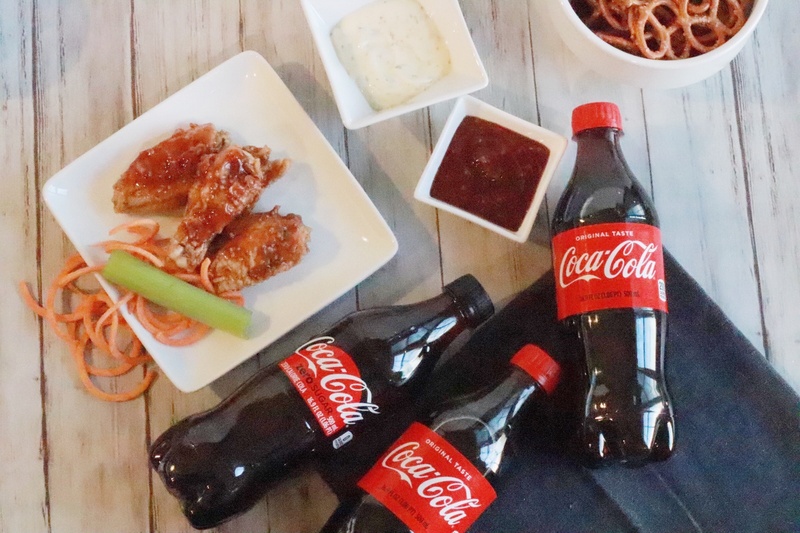 Today, I’m making my famous Crispy Baked Chicken Wings and I’m tossing them in a sweet & sticky sauce starring Coca-Cola. This sauce compliments the crisp chicken perfectly. Plus, it’s a nice alternative to traditional “hot wings”. Coca-Cola is our go to beverage in this house. I mean who doesn’t want to kick back and relax with an ice cold Coca-Cola. We may root for different teams, but at the end of the day that’s one thing we can all agree on. So, it seemed only natural to me that I incorporate it in my sauce as well. This recipe doesn’t require a lot of ingredients and the sauce can easily be made ahead of time and stored in the fridge. That way when those crispy wings come out of the oven they’ll be ready to toss right before the big game! First, you’ll need some game day essentials! 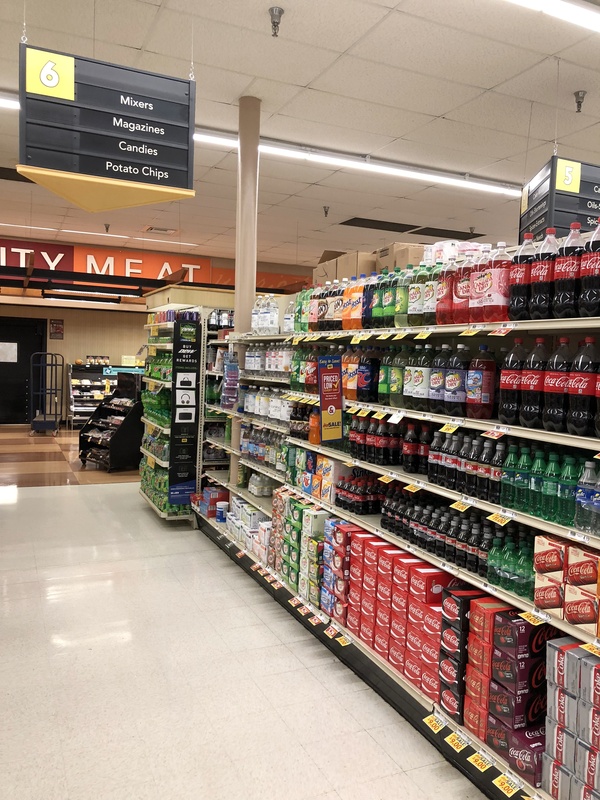 By starting at Food Lion you can find everything you need and save money doing it! 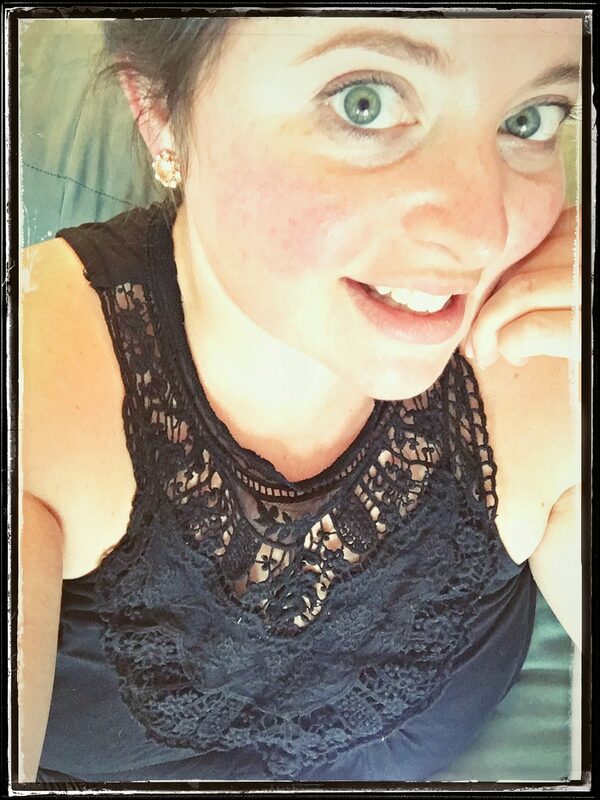 I love that Shop & Earn – Food Lion’s MVP Rewards Program goes a step above. You actually get more savings by buying the things you love! Getting credit for something I’m already going to buy anyway is amazing! Visit the Food Lion Home Page to sign up (if you haven’t yet!) and check out any weekly specials! Next, check out your Shop & Earn page to activate your personalized monthly offers. Then shop, get all of the essentials you need and love, make sure to scan your MVP Card with each purchase you make. Finally, redeem! All earned rewards get added to your MVP wallet and automatically redeemed on your next purchase. It’s as easy as that. I already had a few of the ingredients at home like: milk, bacon, brown sugar, ketchup, garlic ..etc. (The full list of ingredients you’ll need is below in the recipe card, so be sure to check it before you head to the store.) I’m getting everything I need to make the wings, as well as ingredients for a Garlic Ranch Dipping Sauce. Plus, I’m grabbing celery & carrots because if we’re going to have wings, I definitely want fresh, crisp veggies to balance them out! Once you’ve gathered all of your ingredients, it’s time to get cooking! As I mentioned above you can definitely make your sauce ahead of time if need be, just store it in the fridge and reheat on low right before tossing. Today I’m going to get the wings in the oven and while they’re baking I’ll make the sauce! Because I’m taking them straight from freezer to oven they take a little longer, but this gives me plenty of time to work on my other appetizers before the guests arrive! Preheat your oven to 400°. Take out your frozen wings, place them in a large bowl, and evenly coat them with olive oil. Next, spray a shallow baking pan well with cooking spray. Sprinkle just a touch of salt & pepper over your wings. Place your wings on the pan, making sure they aren’t touching. As soon as the oven is preheated put your wings in and set the timer for about 50-55 minutes. Be sure to turn the pan around midway through cooking and flip the wings for even cooking & browning! This is a super easy ranch dip you can make to accompany the wings and veggies! Simply mix all of the above ingredients in a bowl . Place in fridge to thicken up! And voila! Ranch kicked up a notch! It’s time to make the sauce! My favorite part, it’s sticky and sweet and perfectly balances out the crunch of the chicken! You can use either Coca-Cola or Coke Zero Sugar in this sauce. I purchased both mainly because I love them both and like to make sure my guests have options. As I said though, either work well in this sauce, so it really just comes down to personal preference! 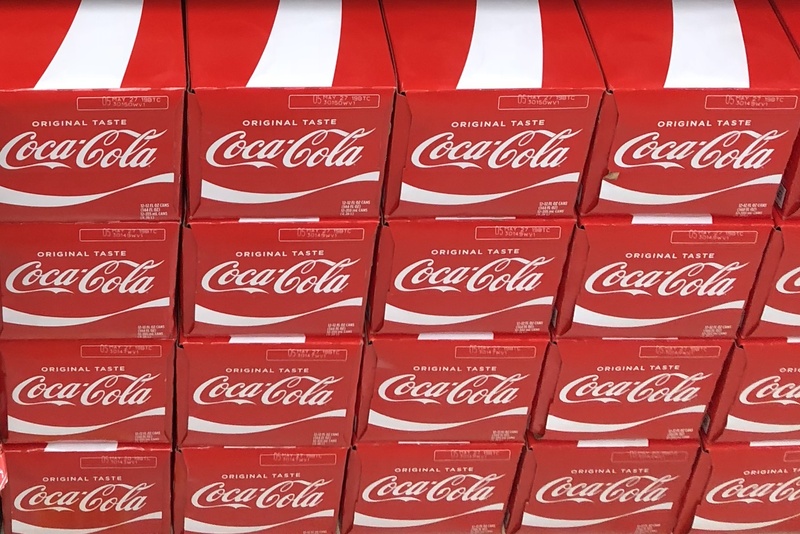 Since, Coke Zero Sugar has the same great Coca-Cola flavor just without any sugar, you will still add the same amount when substituting. Place a small pot on the stove top and turn it up to med-heat. Add your ketchup, crushed garlic, dijon mustard, brown sugar, and Coca-Cola. Stirring often, bring it to a boil. Now you can immediately reduce it to low heat. Cook your bacon, and chop it into small pieces. Add your bacon to the sauce. Let the sauce simmer while your wings cook. This will give it a chance to thicken up a little bit. When the wings reach an internal temp of 165° they are fully cooked! Remove from the oven , let sit for a minute. Finally, place them in a clean bowl and “toss” them evenly with your sauce. Serve with your carrots, celery, and Garlic Ranch. Place frozen wings in a large bowl, and evenly coat them with olive oil. Spray a shallow baking pan well with cooking spray. Sprinkle just a touch of salt & pepper over your wings. Place your wings on the pan, making sure they aren't touching. Chicken is done when it reaches an internal temp of 165°. Place a small pot on the stove top and turn it up to med-heat. Add your ketchup, crushed garlic, dijon mustard, brown sugar, and Coca-Cola. Stirring often, bring it to a boil. Reduce it to low heat. Cook your bacon, and chop it into small pieces. Add your bacon to the sauce. Let the sauce simmer while your wings cook. This will give it a chance to thicken up a little bit. Toss wings in sauce & enjoy! 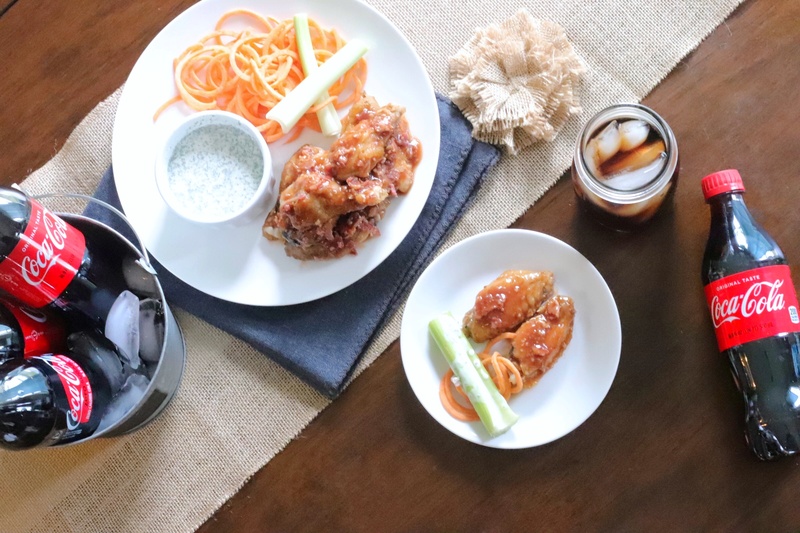 These wings are the perfect addition to any game day spread! 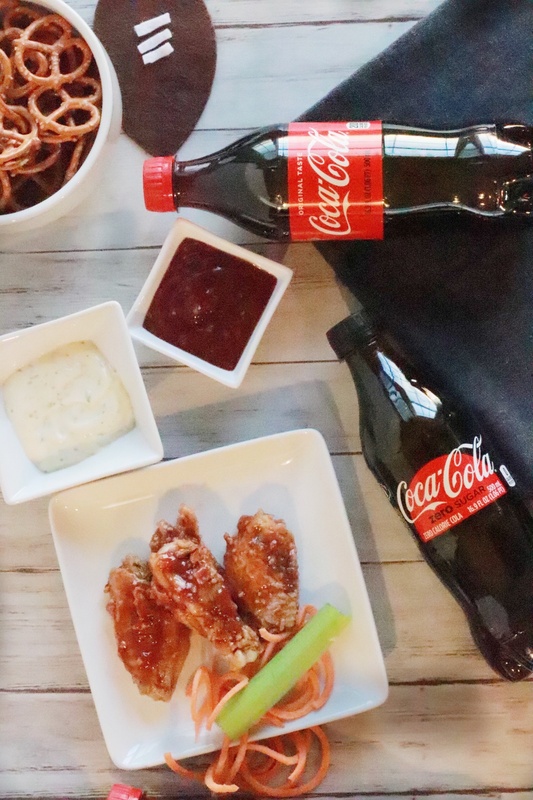 We might all have different teams and different tastes but, one thing is for sure nothing quite brings everyone together like Football, Food, and Coca-Cola! One thing I love about pasta, is its versatility. You can throw it in anything you want. In the summer I love being able to throw in every vegetable I have on hand. That’s exactly what I’m doing with this Chicken & Sausage Fettuccine with Lemon Beurre Blanc Sauce. I’m using Chives, Red Peppers, Yellow Peppers, Mushrooms, Onions, Tomatoes, and Crushed Garlic. I’m also using baked chicken & some chicken sausage. All tied together with a light, fresh Lemon Beurre Blanc Sauce.